In considering boat security, try to think like a criminal. What factors about your boat or moorage would make it an easy target for a thief? Store your vessel so that it is not easily accessed. The best way to keep thieves from stealing property from boats is to not leave valuables aboard. Most thefts occur because boat owners simply fail to remove items from boats, making them easy targets. Removing marine electronics, fishing tackle, and equipment from boats would eliminate the majority of thefts that occur in the marine environment. If not, secure electronics with theft-resistant hardware such as security bolts or screws. Boat owners and fishermen should mark all equipment, including rods, reels, and tackle boxes. Engrave the owner’s social security number and the state’s abbreviation in a concealed area (on reel seat of fishing rods and under the reel seat on fishing reels). These identification numbers will assist law enforcement officers in tracing stolen merchandise back to the owner. Photograph or videotape the interior and exterior of your vessel showing all installed equipment and additional gear/equipment. Open drawers and lockers and photograph interiors and contents. Date and sign the photographs and add any clarifying or identifying messages. Store the photographs in a safe place, not in the boat. Make a complete inventory of your equipment, boat, motors, and trailer and record the serial numbers. Remember that most marine electronics, fish locators, depth finders, GPS devices, VHF radios, stereo systems, battery chargers, and expensive reels also have serial numbers. When provided to law enforcement, these serial numbers can then be listed on the National Crime Information Center stolen list. In the event of any type of loss, this information will prove invaluable in making a prompt, accurate report for law enforcement and insurance personnel. Remove small outboard motors from boats that will be left unattended for an extended period of time. An alternative to removing these motors would be to add an outboard motor lock, which can make them somewhat more secure. While these devices can be pried off, the time and noise involved will make it more trouble than it is worth for many thieves. Personal watercraft have become another popular target of boat thieves. They are relatively easy to transport or tow from a dock and are becoming the most popular boats for resale. Owners of these boats should use heavy vinyl-coated cable or log chains and shielded locks to secure them to a support post or other stationary fixture on the dock. Always remove the kill switch when left unattended. Trailerable boats are the most frequent targets of marine theft. Stealing a boat is much easier if a thief can hitch up to your boat and trailer and drive away. These tips may help: If possible, store the boat and trailer in a locked garage, secured boat-storage facility or mini-storage stall. If the boat is stored at home, put it in the back or side yard out of sight. If storing a boat in an open driveway, carport, or open side lot, park another vehicle or other large object in front of the trailer. An effective, preventive measure for outside storage is to remove one trailer wheel. Store the spare tire in an automobile, truck, or secure it to the trailer with a chain and lock. Secure the boat and trailer to a secure object with a good quality chain and lock. Purchase a good quality trailer hitch lock and use it – even if stored inside. There may be some equipment that must be left on the vessel. Secure these items only in lockable storage areas. Keep in mind that many times the storage area locks installed by the boat manufacturer are not adequate to deter thieves. Boat dealerships and marinas offer special after-market security devices, such as Loc-R-Bar for bass boats, which can be used to better secure boat storage compartments. Remember: out of sight – out of mind. Houseboats, cruisers, and boats with cuddy cabins are not generally constructed with security in mind. However, there are several things that can be done to reduce the risk of vessel theft in these types of boats. Marine Hatch – Marine dealers carry special exterior hatch locks. When fastened with a quality padlock, one of these improves security. Hinges and hatches are another weak point. Depending on the type of boat, it may be possible to add or substitute hinges for improved security. Windows – For sliding windows, place a length of doweling in the track to prevent the window from being forced open. Locksmiths and hardware dealers also carry a variety of special, small locks and fasteners , which can be used to increase the security of other types of windows. There are many systems that can be installed on boats. Care should be taken to select one designed for marine use – one that is resistant to water, salt, and humidity and has a reset function. Store your vessel and trailer in a locked garage/storage. Secure the vessel and trailer to a secure object with a good quality chain and lock. If moored, secure the vessel to the dock with a steel cable and lock. Remove trailer wheel if parked for an extended time. Chain and lock the motor and fuel tanks to the vessel. Mark or engrave all equipment with an identifier such as your driver’s license number including state abbreviation. 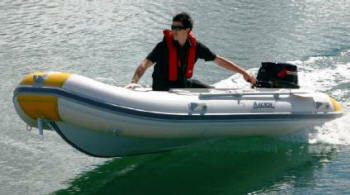 Photograph or videotape the interior and exterior of your vessel showing all gear and equipment. Title and register your vessel. Make a complete inventory of your equipment, vessel and trailer. Remove expensive electronics or other valuables if the vessel is left unattended. Cover your vessel and always remove the keys. Be careful when buying a boat because it could be stolen. Be certain that the boat’s description on the title matches the boat you are buying. Check year, make, length, and hull identification number. Be sure the model and serial number on an outboard motor have not been removed, tampered with, or altered. Be suspicious of a fresh paint job on a late model vessel. When buying a used vessel, try to deal with a reputable marine dealer or a broker licensed by the state. If the price seems too good to be true, there is a good chance that it is stolen. This applies to marine equipment and fishing tackle also. Don’t provide a market for stolen property! Use your written and photographic marine record to give specific and complete information. Dock lockers are convenient and can be very effective for storage of equipment if care is taken to make sure they are secure. Lightweight hasps and locks are easily broken or cut, providing access to equipment stored inside. The doors on dock lockers need to be secured with an angle iron cross bar or heavy-duty hasps and specially shielded locks. These locks are more expensive initially, but are much less susceptible to being cut by bolt cutters and are practically indestructible. Premium stainless steel boat props are expensive items that are popular targets for thieves. After-market prop locks are available and are a worthwhile investment. Many boat thieves are successful because they look like they belong in the area. Become acquainted with your dock neighbors. Help start a “dock-watch” program at your marina or community dock. A tactful offer to assist a stranger in finding a person or a boat may alert thieves that you are looking out for each other. Never leave the keys aboard, not even in a hidden place. Lockable gates should be installed where the walkway from the shore is attached to the main dock. This will not deter thieves accessing docks by boat or by swimming, but most successful investigations resulting in apprehension of thieves have proven that they usually access docks from the land and by vehicle, not by boat.